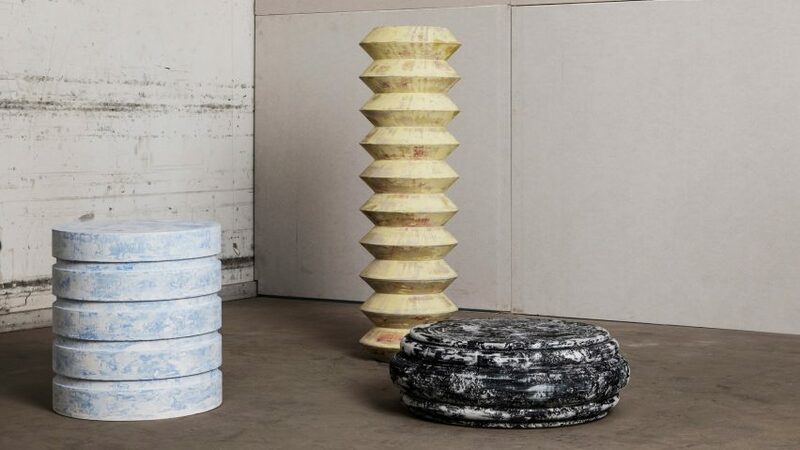 Danish design studio Flensted Mouritzen has created a running mould machine that makes sculptural plaster objects with mottled surfaces. Called Revolve, their series of plaster objects are made using a running mould process where a metal profile is run through wet plaster to form a continuous form with smooth ridges. This artisanal technique is typically used to make plaster cornicing found in classical architecture. "This project is rooted in our interest in old stucco materials and moulding techniques," said Troels Flensted and Ragna Mouritzen, who together founded the studio. "The resulting objects are ambiguous pieces that exist somewhere in between function and sculpture." Adapting the heritage technique, the studio builds up layers of plaster, hide glue and wax dyed with different colours of pigment. When the plaster is about to set, the volume is run through a specially-created turning machine on a rotating wheel. A vertical wooden board fitted with a sharp metal profile is mounted perpendicular to the wheel shaping the layers of plaster as the wheel rotates. The studio uses a different shaped profile for each sculpture. The result is a series of totem-like sculptures with perfectly smooth surfaces made up of patchy colours. "Every piece begins with a line," they explained. "Through the building up of material, the three-dimensional manifestation of that line is created. The objects are simultaneously built and decorated through the process of their making." "The process of building up the layers to create the form is emphasised by using different pigments in each layer of the stucco material, making their creation very present in the finished object," the studio continued. The pieces were originally made for the 2018 Reform Design Biennale at Munkeruphus in Denmark. In 2012 London designer Phil Cuttance built a machine to cast faceted vases that are unique every time. Made of water-based resin, the vases are rotated inside a folded mould as it hardens. The mould can be altered before each casting by pushing and pulling parts of the folded plastic net inwards and outwards.